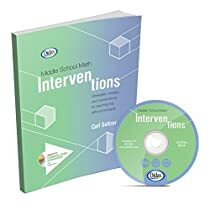 Reteach foundational math concepts using the models found in this book! Easy-to-follow format guides teachers of students in grades 5-9 in using manipulatives, visual models, and mental math to reinforce algorithm learning. Each chapter covers a specific area – multiplication, division, fractions, decimals, algebra, and word problems – and includes vocabulary, common difficulties at each stage of student learning, current research, and practice and assessment ideas. 176 pages. Includes CD-ROM for IWB presentation.WORKS WITH ALL BRANDS OF INTERACTIVE WHITE BOARDS.